The call for i-Spaces labels 2019 is now open! By this labelling process, the BDVA recognizes the quality of existing data innovation spaces or hubs in Europe, and guarantees that the innovation environments provided by those initiatives meet the necessary requirements to boost data driven and AI based innovation at local level, but also the collaboration with similar initiatives to foster the adoption at European level. The label is a well recognized brand, offers a quality reference and provides visibility to national initiatives on Big Data and Artificial Intelligence. How to become a labelled BDVA i-Space? Application for BDVA i-Space label: fill out the questionnaire and send it to ispace-label@core.bdva.eu no later than 31st of May. Online interviews: Foreseen mid-June 2019 (only if needed). Communication of results: September 2019. 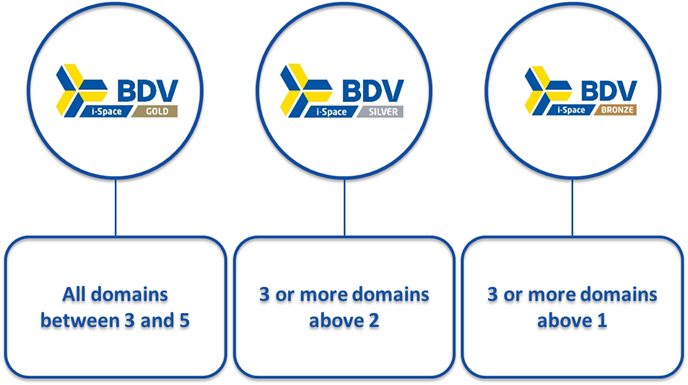 The i-Space label applicant is responsible to ensure all information supplied to BDVA gives a realistic representation of verifiable status of the i-Space. The applicant might be requested some additional information/evidence during the evaluation process. If the applicant does not provide the requested evidence or the information provided reveals substantial discrepancies to the reported status, any running procedure may be stopped and prior granted labels may be revoked, at any time on the sole authority of the Review Committee after agreement with the BDVA Secretary General.